Subjective beauty or just ugly? The newly established art museum in Hefei, Anhui Province has raised discussion over the aesthetics of buildings. The art museum, built to mimic the National Stadium (Bird's Nest) in Beijing, has been dubbed "chicken coop" by locals. The China Central Television (CCTV) new tower has always been controversial for its futuristic design since the building first emerged. It took top place as the "ugliest building in China" last year, in an online poll organized by architecture website archcy.com. Some experts see the ugly buildings in China as a manifestation of China's power aesthetics while others see it as a result of a lack of domestic architectural culture; in any case, most uniformly agree for change. In 2004, China News Weeks published the article, "Power Aesthetics: The Biggest Enemy of Chinese Architecture," analyzing the design of domestic buildings in relation to traditions of power. The idea of "power aesthetics," as the article proposes, is to construct exaggerated and similar buildings to represent the power of the authorities. The Forbidden City is an example of the Chinese power aesthetic. The article states that as China entered the 21st century, a new theory was created, namely the so-called "time aesthetic." Investors and developers began constructing large, modern buildings in a short amount of time, ignoring safety and other important, relevant issues. The pursuit of size and speed has created a vicious cycle, making buildings resemble propaganda or marketing tools for investors. The urbanization and economic development of China over the last decades has created a plethora of ugly buildings. Cao Xiaoxi, deputy chief architect at China Architecture Design and Research Group, said that architecture is the complex mix of a building's function, resources, occupants, arts and technology. It is a reflection of the relationship between the people and the environment. He links the phenomenon of aesthetically displeasing buildings in China to the absence of local architectural culture, an overall messy management of the industry and ability of the architects. "All the theories we learn at university are from the West," said Cao. Fang Zhenning, an art and architecture critic, summarized Chinese architectural culture as having five distinct characteristics: a complex relationship between private and State-owned projects, a focus on investors and estate developers instead of architects, the struggle between modernity and tradition in design, the diverse development of buildings in different regions, and the learning of traditional technology and techniques. The contradictions between old and new, urban and rural make it difficult for Chinese architects to find their own style. Wang Shu, winner of this year's Pritzker Prize, was the first Chinese laureate since the prize was established in 1979. Cao said that Wang offers an alternative way of urban planning, a way of reducing existing contrasts. Another award-winning architecture, the Fangyuan building in Shenyang, was the only Asian architecture that won a prize at the International Architecture Exhibition in Venice in 2000. The designer, Taiwan architect C.Y. Lee, was inspired by the shape of a traditional Chinese coin, symbolic of a wealthy and prospective future. Unfortunately, it seems Lee's idea was not translated well. Fangyuan was selected as one of the top 10 ugliest buildings in the world by a lifestyle and travel website of CNN as well as one of the 21 ugliest buildings ever designed or built in the world by British newspaper The Guardian. In May, Sina Weibo created a site for neitzens to vote on the Fangyuan matter. Over 500 participants found the building "beautiful" while 200 netizens voted in favor of "ugly." The contradictory results leads to a philosophical question: Can aesthetics purely be objective, or are they subjective and influenced by cultural determinants? Xu Deming, a lecturer at Fudan University said in an interview with sina.com that he finds Fangyuan unique, memorable and nationalistic. "It is different from other ordinary buildings," said Xu. He encourages original designs, as the lack of creativity and personality in Chinese architectures is what separates China from developed countries. 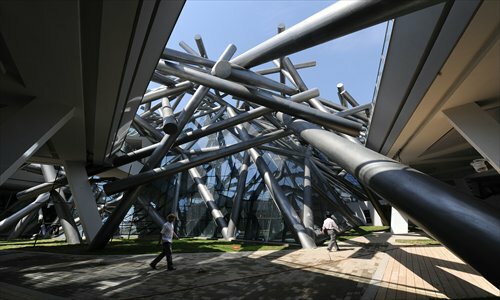 An architect surnamed Sun said that he finds the CCTV new headquarters and the National Centre for the Performing Arts (NCPA) not as bad as poll results on archchy.com suggests. He said that most people do not pay attention to the interior of the NCPA. Sometimes referred to as a "bird's egg," the NCPA has been criticized for its high construction costs and futuristic design, in stark contrast to its surroundings. Sun thereby suggests improving the understanding of architecture among the public. The scrutiny is not just on China. Distasteful buildings are everywhere. BBC News Magazine published an article last year asking why "so many ugly, bland buildings were constructed in the last 20 years." The BBC MediaCity complex at Salford Quays was awarded the Carbuncle Cup as the ugliest new building in Britain the same year. Meng Jianmin, the designer of the highly criticized art museum in Hefei defends the individuality of the museum. He accepts that there still isn't a standard criteria for domestic architects, but doesn't regard this as a stumbling block. "This is an experimental work of architecture, and it was complicated to build. There are always spaces for improvement, but the attempt was worthy," he said.